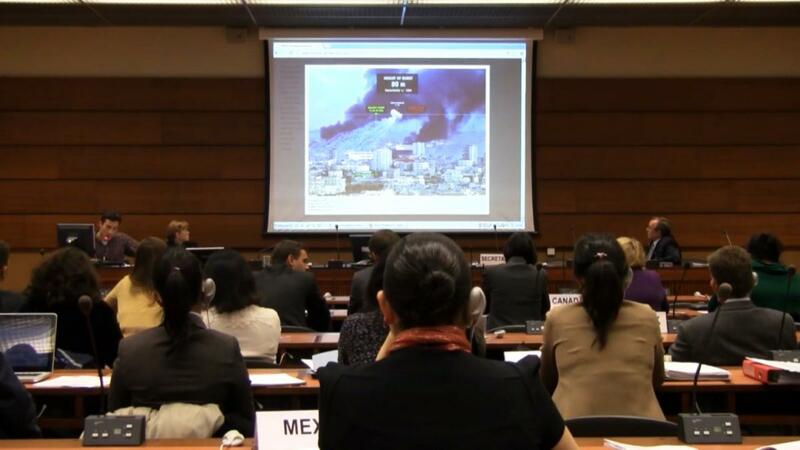 Francesco Sebregondi (Forensic Architecture) presenting the White Phosphorus report in the UN Office at Geneva, November 12, 2013, photo courtesy Forensic Architecture. Forensic Architecture is a lecture by Eyal Weizman, founder and director of the eponymous research agency. Established in 2011 and based at Goldsmiths, University of London, Forensic Architecture is a coalition of researchers drawn from a variety of disciplines – architecture, visual culture, activism, and the law – that research and present spatial analysis of conflict sites for use in political or legal forums. An agency and a methodology, “forensic architecture” uses standard architectural and digital tools such as telemetry and ground penetrating radar with civilian-sourced social media data and eyewitness testimony, examining this material to aid in the discovery and visualization of contested conflict zones. Termed the “architecture of public truth,” Forensic Architecture’s investigations have provided evidence of human rights abuses to international prosecution teams, political organizations, and the United Nations. Pioneering research on the deployment of drones by the US military in Yemen and Pakistan (2011), and the recent, notable case coproduced with Amnesty International ­– the “Black Friday” report on the events that occurred from August 1 through August 4, 2014 in Rafah, Gaza during the Hannibal directive – have been widely disseminated, commented on, and utilized by international agencies, academia, and the media. This lecture is organized in conjunction with the exhibition Making Use: Life in Postartistic Times. Eyal Weizman is an architect, Princeton Global Scholar, Professor of Spatial and Visual Cultures and Director of the Centre for Research Architecture at Goldsmiths, University of London. He is a founding member of the architectural collective DAAR in Beit Sahour/Palestine. Weizman is the recipient of the James Stirling Memorial Lecture Prize for 2006­–2007, a co-recipient of the 2010 Prince Claus Prize for Architecture (for DAAR). He has worked with a variety of NGOs worldwide, presented his research at the UN General Assembly, and provided architectural evidence in a number of war crime trials. His books include FORENSIS (HKW/Sternberg Press 2014), Mengele’s Skull (with Thomas Keenan, Sternberg Press 2012), Forensic Architecture (dOCUMENTA13 notebook 2012), The Least of all Possible Evils (Nottetempo 2009; Verso 2011), and numerous articles in journals, magazines, and edited books. He has lectured, curated, and organized conferences in many institutions worldwide.